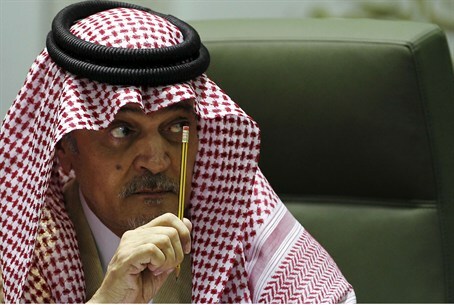 Al-Faisal at OIC calls for Arab unity against Israel which is trying to 'wipe off Palestinian existence,' Israel needs 'peace' to survive. On the heels of reports that Saudi Arabia and the United Arab Emirates (UAE) promised funds to Hamas in order to procure the current 72-hour ceasefire, Saudi Foreign Minister Prince Saud al-Faisal openly pledged $500 million to "rebuild" Gaza. Speaking at an Organization of Islamic Cooperation (OIC) meeting in Jeddah on Tuesday, al-Faisal accused Israel of trying "to wipe off Palestinian existence," and blamed the world for supporting "Israel's savagery against the people of Gaza." Calling for Arab unity at a time when internecine bloodbaths are raging throughout the Middle East, al-Faisal urged the Arab nations to stand together on "one line" to oppose Israel. "Divisions among Islamic nations are causing civil strife, leading Israel to repeat its crimes," said al-Faisal, recommending Arab countries "support all Egyptian efforts to stop the aggression." "The Kingdom of Saudi Arabia considers the Palestinian cause its primary cause," boasted the Saudi foreign minister, announcing that his country would provide $500 million in funding to "rebuild" Gaza. While reports of Saudi funding to promote the ceasefire noted the money was conditional on usage for civilian projects and not the rebuilding of terror tunnels, no system of checks and balances has been presented. Additionally, Hamas routinely uses civilian buildings, schools and hospitals as weapons caches, booby-traps and rocket launch sites. Further, the Palestinian Arab Sawa news agency revealed Sunday that Hamas paid two-months of salary in full that morning to its terrorist "military wing," the Al-Qassam Brigades. It is suspected the sudden unexpected infusion of cash was likely given by Saudi Arabia and the UAE. Taking a slightly more threatening tone in his rhetoric, al-Faisal continued saying "Israel must understand that the only solution for its survival is peace with the Palestinians." "Israel isn't embarrassed to conduct terror on every level in order to achieve its goals, while ignoring laws, religious commandments and humanitarian considerations," charged the Saudi foreign minister. It should be noted that Israel launched Operation Protective Edge in response to a rapid escalation in Hamas rocket fire on its civilian centers, and has agreed to numerous humanitarian ceasefires while taking pains to warn civilians before conducting airstrikes. Concerning al-Faisal's comment on religious commandments, Chairman of the Bnei Akiva Yeshivas and head of Yeshivat Or Etzion, Rabbi Haim Druckman, stated last month that the operation falls under the category of milchemet mitzvah (war of commandment), given that it is a war to defend Israel from attack. "This is a holy war by all accounts, a war of salvation and for the existence of Israel in its homeland," clarified Rabbi Druckman.